There are writers who aren't insecure. They're convinced every word they put on paper is gold. Some are right. Most are wrong. 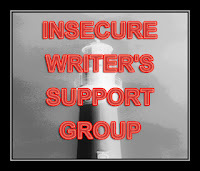 I firmly believe that good writers are insecure. Insecurity, the fear that your work isn't good enough, leads in one of three directions. 1) You throw out what you write, deciding it's crap. 2) You review your work and try to find ways to make it better. 3) You seek out someone you trust and have them give you an honest opinion of your writing. Two out of those three directions (and in some cases, all three) can only lead to improvement. If you're believe your work is perfect, you won't try to make it better. Trying to make it better can only succeed. The trick is not to give in to number one, where you become so paralyzed with insecurity that you never finish anything. If you're on number one, try two and three first. What do you think? Does insecurity lead to improvement? And be sure to check out the other members of the Insecure Writers Group!